Micro Cube display with 30 sets. 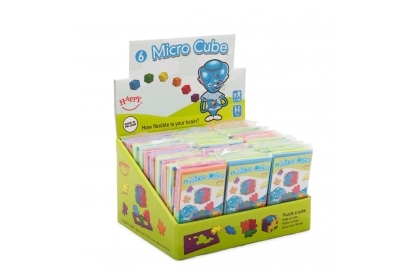 The Micro Cube display contains 30 sets of flowpacked 6-packs. Each 6-pack encloses an instruction paper by which the concept is explained in a symbolic way. On the instruction paper several possible combinations (from 3 levels) are displayed, together with one large construction solution. On the display the making of a more-coloured cube is visualised.